France didn’t take long to find a breakthrough against Iceland, but it was Samuel Umtiti who popped up with the opening goal of the game. 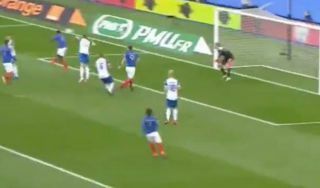 The World Champions took the lead in the 12th minute, with Kylian Mbappe playing a crucial role in the build-up to the goal, as seen in the video below. The Paris Saint-Germain ace picked the ball up on the left flank, and after cutting inside onto his right foot following a brilliant first touch to get control instantly, he delivered a perfect cross into the box. In fairness, Umtiti still had work to do to angle his glancing header towards goal as it went in off the post, and so while it may not be the most eye-catching of goals during the international break, there was certainly plenty of quality involved. After brushing Moldova aside last time out, France look in ominous form to begin their Euro 2020 qualifying campaign and it certainly helps when your centre-half finds his way into the opposition box to score goals too.